We signed up for Dish Network. The owners left their satellite, and the price just seemed too hard to beat. Plus, since we won’t have as much vacation money this year (between the move and me temporarily jobless), we figured that we’d be using our TV a lot more than Milledgeville and deserve the investment of some channels. An extra incentive of Dish Network was it came (we signed up a day before this promotion ended) with a year of Blockbuster rentals. We get the mailed Blu-Rays and DVDs (one at a time), as well as Blockbuster streaming. We had this Blockbuster service when we lived in Asheville. I do think it trumps Netflix with its incentive of store trade-ins—it’s a built-in bonus movie. I spent an hour the day of enrollment working on creating our queue, and I’m really excited about the lineup. 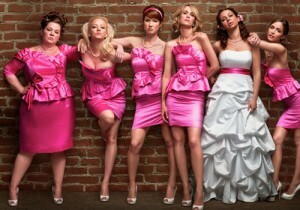 The first Blu-Ray we received was Bridesmaids, and we watched it last night. Derrick and I were just talking about this movie the other day, and, since we are coming up on our anniversary, I thought a wedding movie would be fun. I’d heard mixed things about it, but mostly bought into the hype that this was a The Hangover for girls. I like The Hangover a lot, and I’m not opposed to bawdy humor (There’s Something About Mary IS one of my favorite movies, and it’s definitely gross), so I wasn’t worried about being offended. I’m not sure if our Blu-Ray’s edit was the same as the theatrical version. To be honest, I’m not really interested in finding out. But at 124 minutes, Bridesmaids was about 40 minutes too long. I was too bored to ever be offended. Derrick sorted through tax-related papers during the movie, and I wished that I had saved my afternoon pedicure for the evening, because I needed something to keep me busy. Some scenes could’ve been funny (like the toast competition between MOH Annie and MOH-wannabe Helen), but they just went on too long to the point where I became embarrassed and uncomfortable—not because I empathized with the characters, but because I felt sorry for the movie makers who didn’t know how to edit. I also wonder about the movie’s ultimate point. Annie (as the main character) eventually comes to the realization that she can’t blame anyone else for her problems and that she has to take responsibility for her actions. But really, she IS a victim and her actions are not the problem in this movie. She is a great baker, but her business fails in the midst of our bad economy. She wants to have a great relationship, but she (at first) only has a partner interested in the physical. Annie takes the bride to be and fellow bridemaids to a restaurant where everyone gets food poisoning. Helen takes advantage of Annie’s fear of flying, giving her drugs and alcohol that Annie’s body can’t handle. Annie tries to plan a Parisian bridal shower, only to have this idea stolen by Helen. Annie is kicked out of her own apartment by two freaky roommates (a British brother and sister who look like Tweedle Dee and Tweedle Dum”) when they decide that they’re too old to have a roommate. 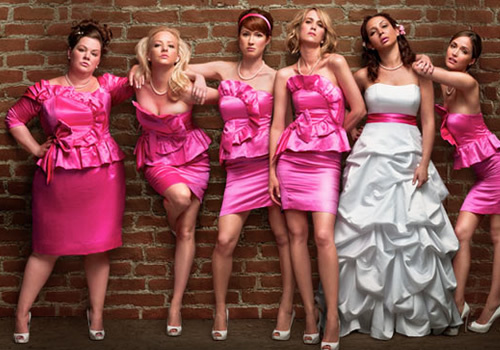 Surrounding characters spend the whole movie telling Annie that she is crazy and that she does this all to herself and that she is having too hard of a time to handle the responsibility of being a MOH. But after every single bad thing happens to Annie in the movie, I wanted to scream at the TV, “IT’S NOT YOUR FAULT.” Still, Annie has to “realize” that it IS her fault, and I left feeling really unsatisfied with what I was supposed to take away from this movie. I know it’s a comedy, but, in any movie (drama or comedy, whatever) if a character has an arc, I should buy it, and I don’t.